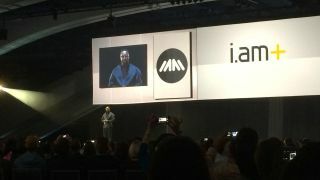 Will.i.am has been teasing his very own wearable for some time now, and finally during his Dreamforce 2014 keynote, the Puls has been revealed. Two and a half years in the making, the Puls smartwatch is now ready for your wrist. The battery is next to a SIM card reader along the watchband. The wearable also has 16GB of onboard memory, 1GB of RAM, speakers, 3G and Wi-Fi capabilities, GPS, pedometer, accelerometer and can make phone calls. Like Apple's Siri, Google Now and Window's Cortana, Puls will also have its own voice controlled feature and assistant named "Andeeda" as in "Aneeda know the score for the game." The Puls doesn't have a heartbeat sensor, but apparently there's an emotion sensor. An algorithm in the app Vibe, from company Beyond Verbal Communication, "collects your vibes" and shares them with other people. Facebook, Instagram and Twitter (or Twitrist on the Puls) are also signature apps you'll get. An AT&T data plan is needed with the smartwatch but a phone is not needed. Rather it's a "stand-alone connected device." O2 will be the exclusive partner in the UK. Will.i.am also notes the Puls is more of a cuff to keep in line with "fashion" to remain appealing to a wider audience. The Puls will be available in black, blue, pink and white. A gold smartband with diamonds and solid gold band are also on the roster. Along with the cuff, a backpack outfitted with speakers, a jacket that can charge the Puls and shoes that act as pedometer and scale will retail at the same time. Pricing and launch date have not been announced for any of the products yet. However, during a press briefing, Will.i.am noted that we can expect to see the Puls this holiday season priced lower than a smartphone, or as he coyly put, "affordable-99."